I’ve been a fan of Susan Feniger and Mary Sue Milliken for 26 years, when I first got their cookbook City Cuisine. When I saw Susan’s cookbook at the Strand I snatched it up right away and after reading it through I couldn’t help but feel like I was her illegitimate off-spring from an immaculate conception. The recipes are great and the book accomplishes something very rare – it’s beautiful to look at and very easy to use – filled with tasty recipes of street food from all over the planet. My only gripe is her use of corn syrup and ketchup without going on a rant (like I do) about GMO’s and HFCS etc. So I guess you could say I provide balance 😉 So when you see those ingredients in her book which you MUST BUY just remember buy Organic or substitute. This recipe I made a while back for a group of friends and it was a big hit. Filled with authentic flavors like curry and lime leaves and lots of wonderful Indian Spices this turns Cracker Jack on it’s head. I have adapted the recipe slightly. 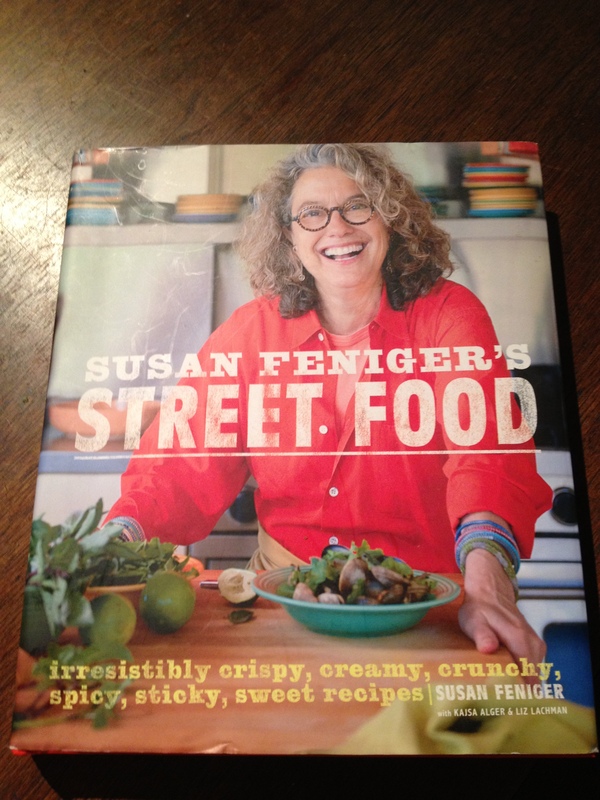 To reiterate – this is a must have cook book and if you are in LA for sure stop in and have meal at her Street Restaurant. In a small bowl combine: 2 cups raw organic peanuts, 2 Tablespoons Coconut Milk (well shaken) 2 Tablespoons of Dark Brown Sugar, 1 Tablespoons of Chopped Fresh Kaffir Limes leaves (about 10), 1/2 Teaspoon Salt and 1/4 Teaspoon of Cayenne Pepper. Put the mixture in a heavy skillet over high heat and cook without stirring for about 2 minutes – when the peanuts have started to brown you can begin to stir the mixture. 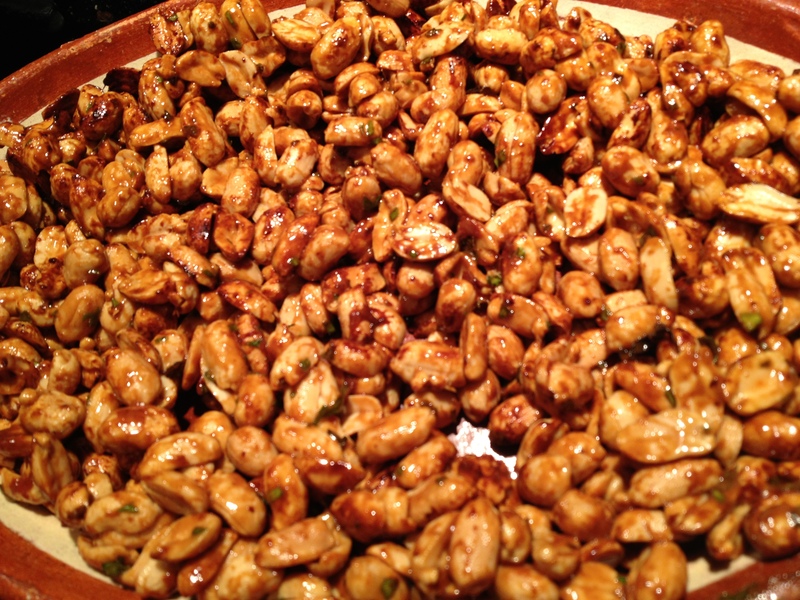 Cook for about 5 minutes – stirring constantly – once the peanuts have brown take them off the heat. The nuts brown unevenly, there probably will be smoke, but not to worry – keep stirring! And when they are nicely brown they are done. 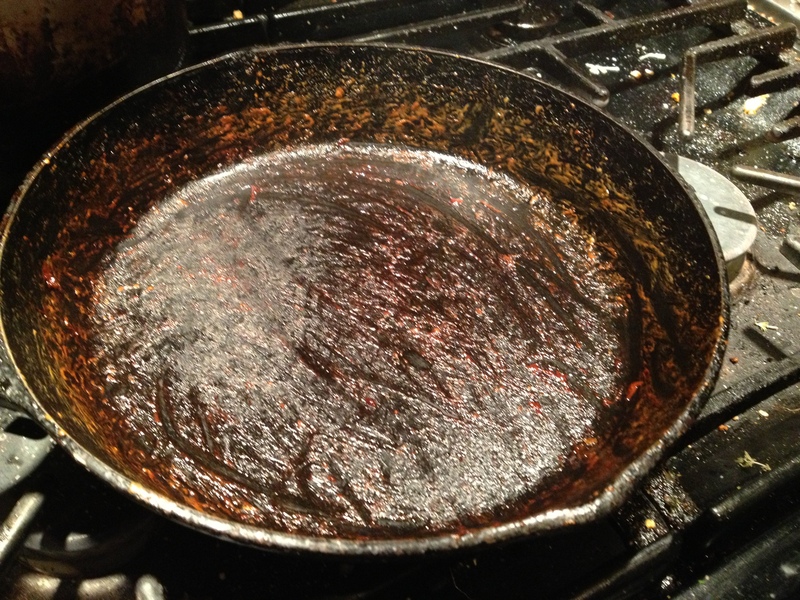 My poor skillet. Now onto the main event! Get the biggest bowl you have and coat it with olive oil. I used a silicone spatula for this but if you are using a wooden spoon coat it with olive oil as well. In baking sheet that has been coated with olive oil scatter 1 1/2 cups of Shredded Unsweetened Coconut. Cook for about 8 minutes or until nicely golden. Set aside to cool. In a large pot with a lid add 3 Tablespoons of unflavored high heat oil (I use Sunflower) add 3/4 cups of Popcorn Kernels and turn the heat up to medium high, cover and shake occasionally until the corn starts to pop, then shake vigorously and constantly until the kernels stop popping. Turn off heat keep covered until there is no more popping. Carefully remove the popcorn into the big oiled bowl, careful to sort out any of the unpopped kernels. 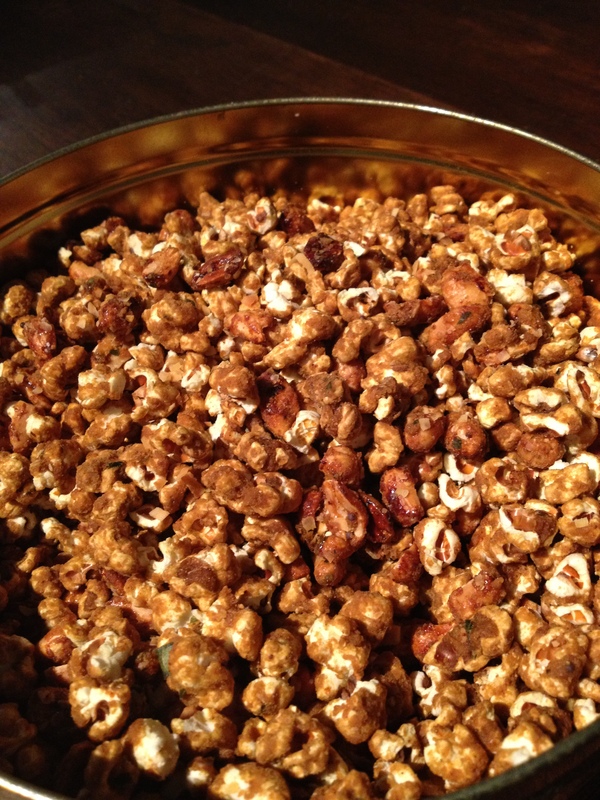 Add the toasted coconut and the candied peanuts to the popcorn. Coat two cookie sheets with oil. In a medium sized heavy bottomed pot add 2 cups Dark Brown Sugar, 1 cup of Unsalted Butter (2 sticks) and 1/2 cup of either Lyle’s Syrup, Honey or Maple Syrup heat over medium high heat until the butter is melted stir occasionally, once the better has melted and the mixture starts to bubble stir constantly, the cook the mixture until it thickens and reached 255 F on a candy thermometer – about 7 minutes. If you don’t have a thermometer you will know its done when the bubbles get larger and slower. Remove from the heat and add: 1 1/2 Teaspoons of Salt, 1/2 Teaspoon Baking Soda, 1 Teaspoon of Black Mustard Seeds, 1 Teaspoon of Tumeric, 1 Teaspoon Cumin Seeds, 3 Tablespoons of chopped fresh Curry Leaves, 1/2 Teaspoon of Ground Nutmeg, 1/2 Teaspoon of Paprika, 1/4 Teaspoon Cayenne Pepper, 1/4 Teaspoon Cinnamon stir quickly to incorporate then pour over the popcorn mixture. Mix well until the popcorn is all coated (it takes some diligence). Divide the mixture between the two prepared baking sheets and bake for 1 hour, stirring the mixture every 20 or so minutes. Remove from oven and let cool to room temperature – it will get crunchier as it cools. Your party guests will love you for making this – trust me. This entry was posted in Recipes and tagged curried caramel corn, Indian Food, popcorn, SE Asian Food, Street Restaurant, Susan Feniger. Bookmark the permalink.